PICK ME-Pride of ownership is apparent with this beautiful Corpus Christi perfectly located in the Village of Summerhill. The landscaping speaks Florida living surrounding you with the many colors along with the painted coated driveway and walkway. The interior highlights include split floor plan, three bedrooms, two full baths, tile & laminate flooring, spacious enclosed lanai and NO HOMES BEHIND. The Kitchen boasts plenty of cabinets, tile flooring, pantry, and nice breakfast counter. The spacious master bedroom has a walk-in closet adjoined with master bath. Additional features include a light and bright living room and dining room with a split floor plan with second and third bedroom (does not have a closet) serviced by a hall guest bath. 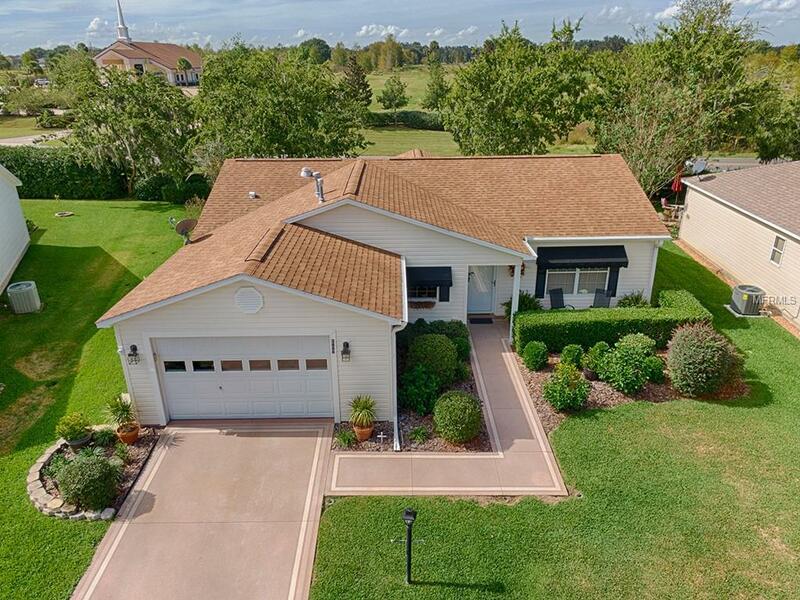 This home also features one car garage with golf cart parking and natural gas utilities. Back outdoor space includes concrete pad for a nice sunny area and grilling. NEW HVAC 2018, Water Heater 2015, Roof 2013, Appliances 2017. This home is located in Sumter County. Low bond balance is approximately $5,395. The Village of Summerhill is close to shopping, restaurants, golf, swimming plus more. The Saddlebrook Recreation Center offers bocce, shuffleboard, tennis, pickleball, and horseshoes outside, and billiard tables inside. The adult pool is a great place to enjoy. The Saddlebrook Softball Complex is right next door along with the Polo Fields for great fun. HOME is where your story begins. Let this be the start of your next CHAPTER!